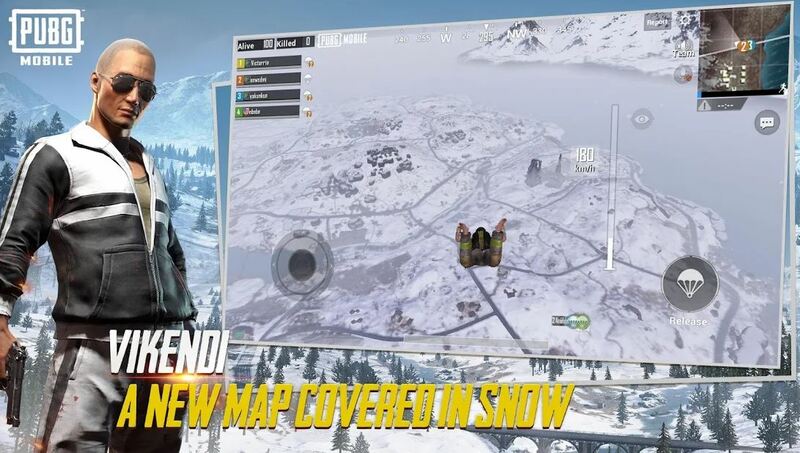 PUBG Mobile update: The much awaited Vikendi snow map with v0.10.0 update for both Android and iOS platforms are released by the PlayerUnknown’s Battleground (PUBG)-developer Tencent Games. The company has given 24 hours for the fans to download the latest update for the new challenge. Also, other additional features have added with some bug fixes to the game. The PUBG Mobile Vikendi snow map download size is 134.2MB on Android and iOS. The matchmaking starts the next day (21 December) same time. The company claims the Vikendi is 6km x 6km map which is now available to download from 0:00 UTC on 20th of December 2018 to 21st December at 00:00 UTC. The new Vikendi snow map is available for download within the app itself. So, the users can head to the map section and start downloading the map. The latest update comes with several new themes, cold weather matching costumes for PUBG Mobile players, snowmobile and also new Firearms Finish Upgrade System, so that players can use materials at the Lab to upgrade certain weapon finishes, additional kill effects, distinctive kill broadcasts, and death crate appearances. Go to Google Play store and then type PUBG Mobile, click on ‘Update’ button for the latest features. OR also, update the app within the app itself. For iOS users, go to App Store, then type PUBG Mobile and tap the ‘Update’ button for these features which all listed below. Snowball Fight added to Vikendi’s Spawn Island. Snow theme to the main menu. Collect bells from all Classic mode matches and exchange them for rewards at the event centre! Cross-server matchmaking. After enabling, players have a chance to be matched to players of the same tier on other servers. Layout for players with large hands. Tags to items with quality, categories and background information. Display for Crew Challenge winners on Erangel’s Spawn Island. Season 1’s winning teams will appear on the Spawn Island of their respective server and modes. Season 2 registration starts at 0:00 UTC on 18 DEC 2018! Firearms Finish Upgrade System, where players can use materials at the Lab to upgrade certain weapon finishes to get additional kill effects, unique kill broadcasts, and death crate appearances. Lucky Treasure, a feature that gives players a chance to get an upgradable weapon to finish Glacier – M416 when they finish daily missions. Season spending rewards. Spend different amounts to get excellent rewards and steep discounts on firearm finishes. PUBG Mobile 0.10.0 comes with Arabic language support and stricter rules for casual players. Find the full patch notes for PUBG Mobile 0.10.0 here. PUBG Mobile on Android is very popular in markets at present where there aren’t many PCs or consoles, but also the game is better on mobile than other devices.